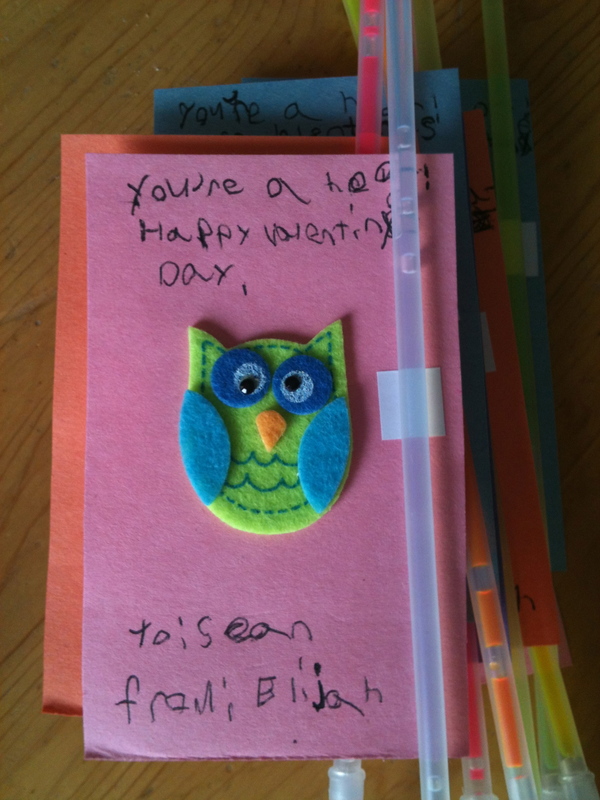 I was determined not to buy valentines this year for Elijah to hand out. We had enough leftover valentines for Miles to hand out to his preschool classmates. I wanted to make something handmade. My good friend Casual Perfect hand makes hers every year, I just needed to settle on something that wouldn’t be overwhelming. Today was craft day! 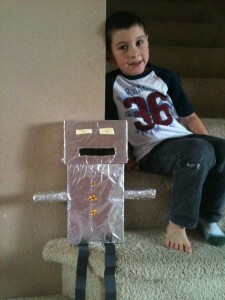 We first needed to construct Elijah’s valentine box. His teacher sent home some suggestions, but I searched Pinterest to get some inspiration. We settled on making a robot, figuring that it would simply be boxes covered in aluminum foil. I instructed Elijah to decide on shapes, and how the valentines would make it in and out of the box. He designed it, I assisted with cutting the box, and he assembled it. Here’s the finished project. The head flops back (think Terrance & Philip) to retrieve the valentines. Next up, were the actual valentines. Again, I drew inspiration from Pinterest. I found cute felt owl stickers at the craft store, along with a glow in the dark bracelets. I rarely let the kids eat the crappy candy that comes with their valentines, so I knew our valentines were’t going to have them. 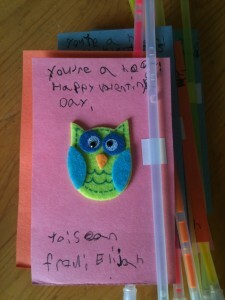 This entry was posted in Crafts, kids, school and tagged Crafts, Valentine's Day Crafts by melissius. Bookmark the permalink. What an amazing idea and beautifully executed. This is one proud Nana! great valentines! well done Elijah and mommy!